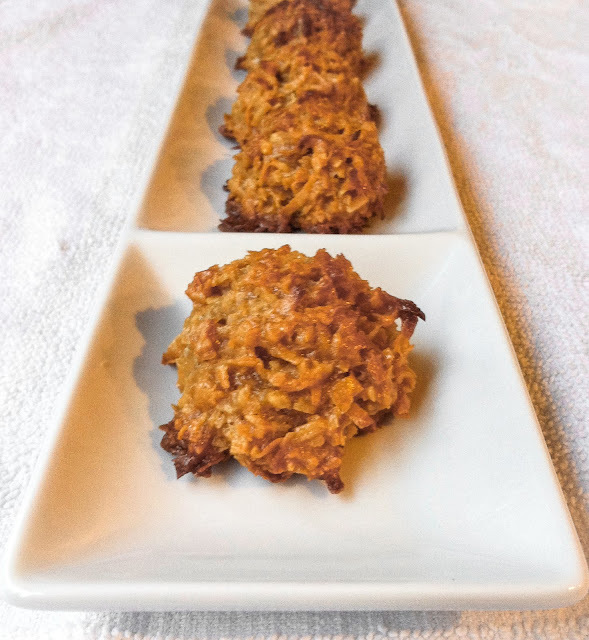 ...an easy, tasty cookie from only 5 ingredients. I had a mad craving for something sweet, just one small bite, and I wanted it right now! No, a piece of fruit wouldn't do, neither would cinnamon toast. Dark chocolate baking chips didn't appeal and the freezer held no ice cream. Dang! there was a serious shortage of tempting sweets in my kitchen. 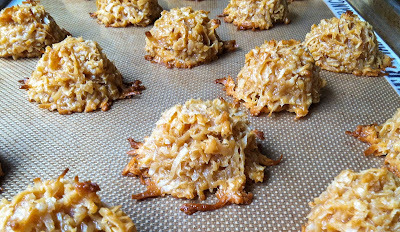 Emergency averted - Coconut Macaroons to the rescue. Note: not the fancy, fussy meringue-based European macarons made with almond flour, egg whites, and sugars, then filled with buttercream, ganache or fruit curd. No way! 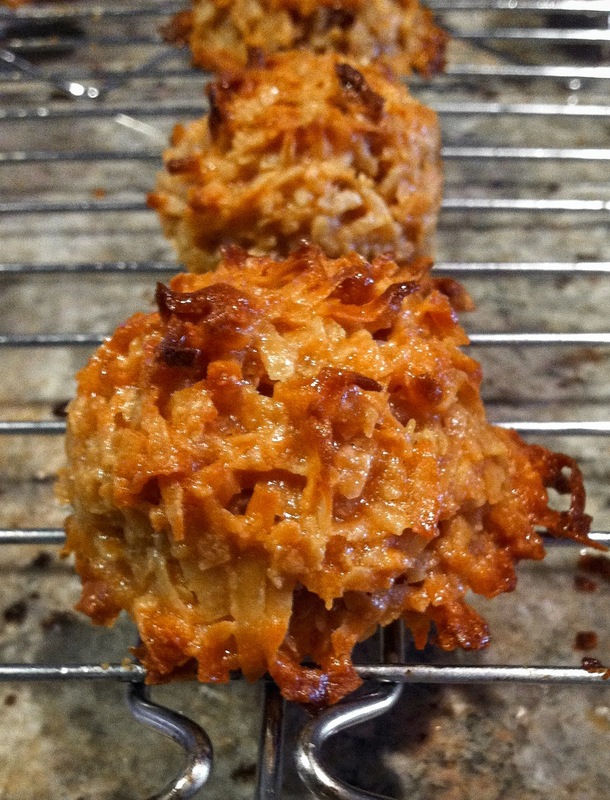 These macaroons were the sticky mounds of coconut and condensed milk; Mom's midwestern version with crisp, browned exterior and a soft, chewy centers. Macaroons, not macarons. My holiday cookie enthusiasm left extra packages of shredded coconut and cans of sweetened condensed milk in the pantry. 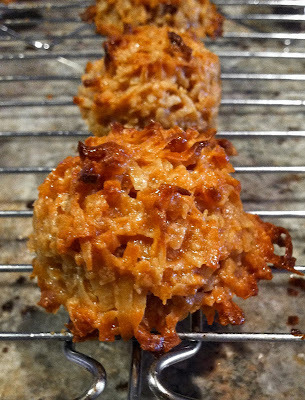 I'm not wildly fond of coconut desserts, so it's easy to forget about macaroons. Suddenly, these cookies seemed perfect - it was a semi-emergency. Fast and easy to prepare, those unfussy mounds of coconut were the perfect solution to my sudden sweet tooth craving. RL loves macaroons, so none were wasted after I enjoyed one or two... or maybe three. Occasionally I dip the flat bottoms in melted chocolate, or drizzle zigzags of melted dark chocolate across the tops. 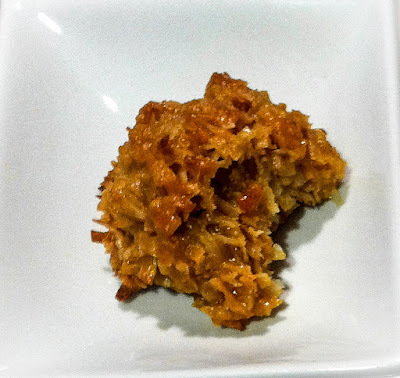 Chocolate dresses up the appearance, even tempting coconut-averse chocolate lovers to try a coconut macaroon. This time I baked a half-batch and skipped the chocolate dipping or drizzles. The cookies lasted several days, their exteriors initially crisp but growing soft and chewy after a stay in the cookie jar. No complaints were registered with the cook, however. 1. 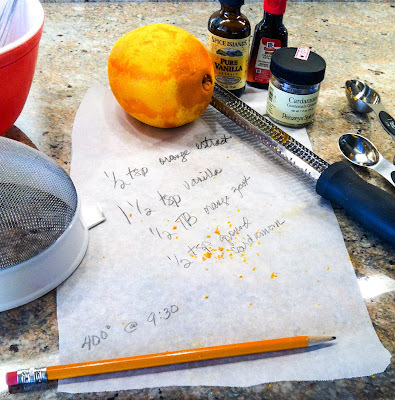 Preheat oven to 350 F. Grease a cookie sheet, or cover with parchment paper or a silicone mat. 2. Mix flour, coconut and salt together in a bowl. Add condensed milk and vanilla; stir well by hand to make a thick batter. 3. Use a cookie or ice-cream scoop to form cookies; place on baking sheet, allowing an inch or two of space between cookies. Bake for 15-20 minutes*, or until just golden brown. Remove from pan at once, and cool on baking racks. *Baking time will vary with size and height of scooped cookie and with different ovens. 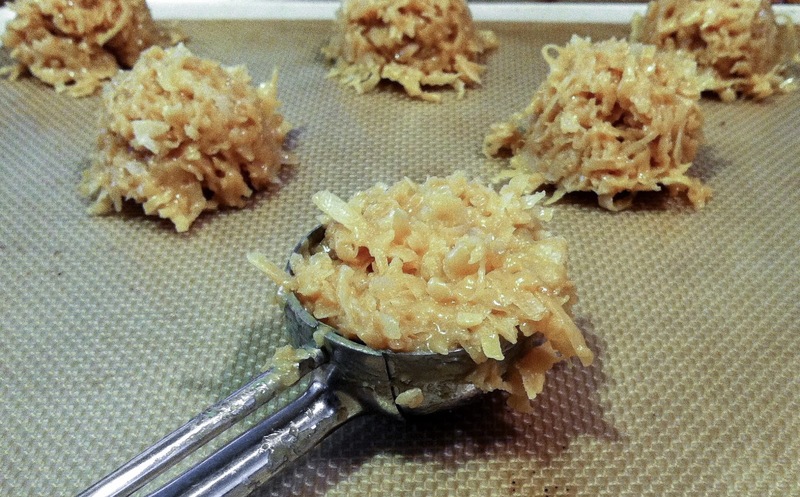 The boat oven bakes small versions of these cookies in 12-15 minutes. 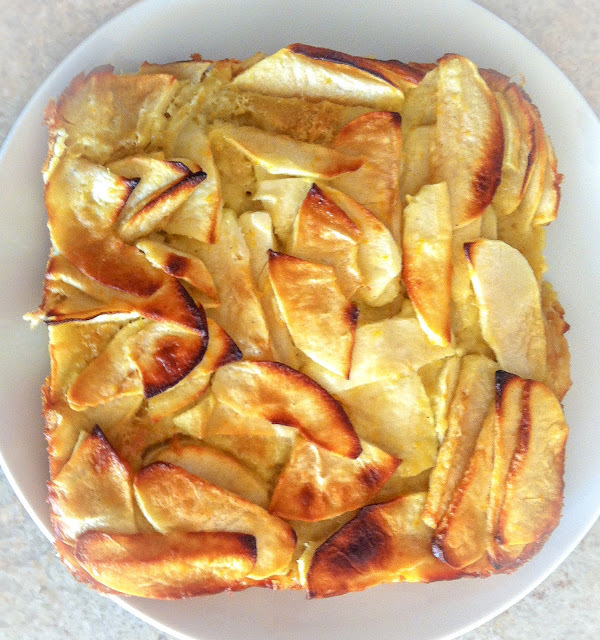 Two years ago, almost to the day, I posted an update to a Serious Eats/Dorie Greenspan recipe for Fresh Apple Custard Cake. Deemed just "okay" from the first bite, I keep tweaking the recipe looking for something more... moreish flavorwise. My variations on Dorie's apple cake have all been fragrant, moist, custardy and applely, but a bit bland, lacking any notable flavor pop. Additions of lemon zest, almond extract and apple pie spice have upped the flavor impact, but never quite hit the mark. Then I found several online recipes for Swedish Apple Cake with Custard Sauce that sent me in another direction. Orange extract and grated orange zest plus ground cardamom were the new flavor additions of choice. Still moist and fragrant, almost a cake and not quite a custard, the latest variation has met two-thumbs-up approval. The orange and cardamom somehow boost the appleness of the cake, providing an interesting combination of flavors in each bite. The custardlike filling negates the need for a custard sauce, though a dab of honey Greek yogurt made a fine topping. Hmmm, a scoop of homemade Cardamom Ice Cream would turn this morning treat into a scrumptious dessert. It's fun to play with recipes, adjusting ingredients but keeping the character of the original dish. Orange and cardamom will remain key flavor elements in my version of this custardy cake, but nuts might join the party next time. "elegantly thin, but not so thin that they’re transparent and fragile," according to Dorie. Use a small bowl and whisk together the flour, baking powder and cardamom. Set aside. In a larger bowl whisk the eggs and sugar together for a minute or two until the sugar dissolves. Whisk in the orange extract and vanilla, then the milk and finally the melted butter and orange zest. Sift the flour mixture into the bowl in 2 or 3 additions and whisk until smooth. 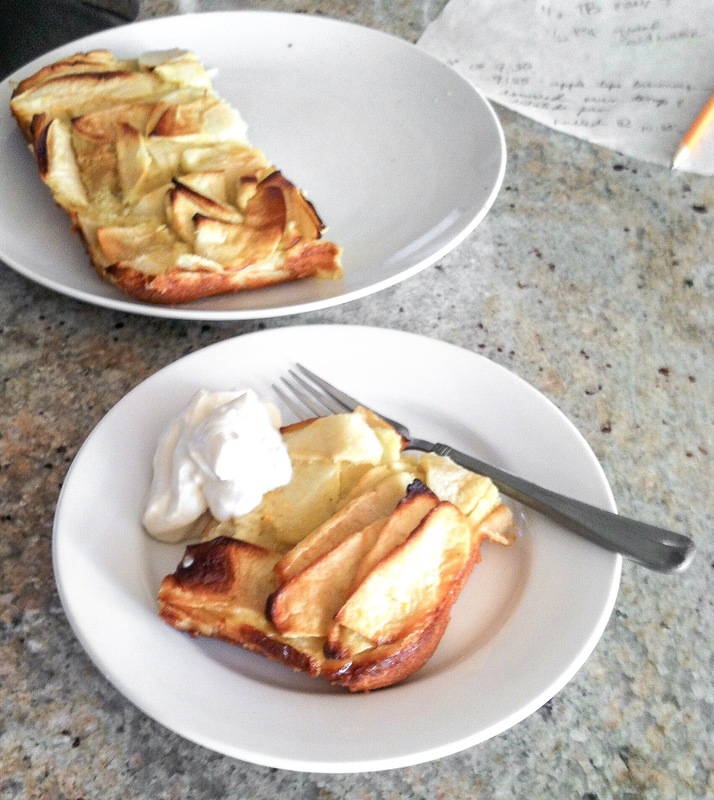 Add the apples and gently fold into the batter using a rubber or silicone spatula, turning to coat each thin slice with batter. 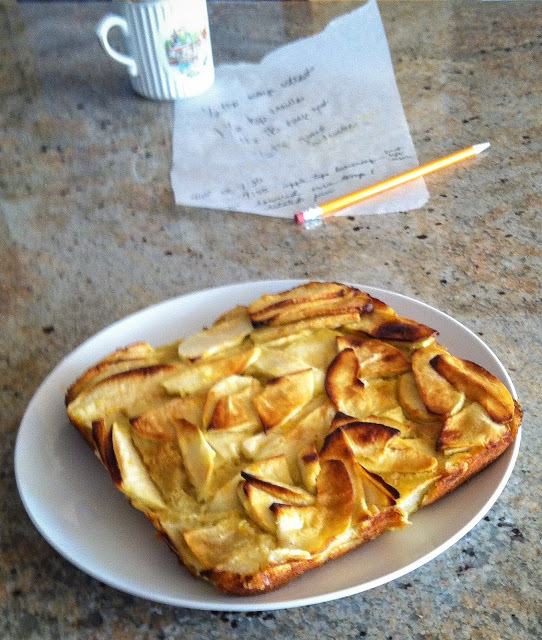 Scrape the mixture into the parchment-covered pan and smooth out the top so the apples lie flat. Bake, rotating the pan halfway through, until golden brown and uniformly puffed, 40-50 minutes. (55 min in my oven) Be sure the middle of the cake has risen and a knife inserted into the center comes out clean. Remove from the oven and place on a cooling rack; allow to cool and set up for at least 15 minutes. Unmold the cake bottom-side-up onto a plate and peel off the parchment paper. Flip it back onto a second plate and cut into squares. Dust with powdered sugar or cinnamon/sugar mix (optional). Cut and serve. 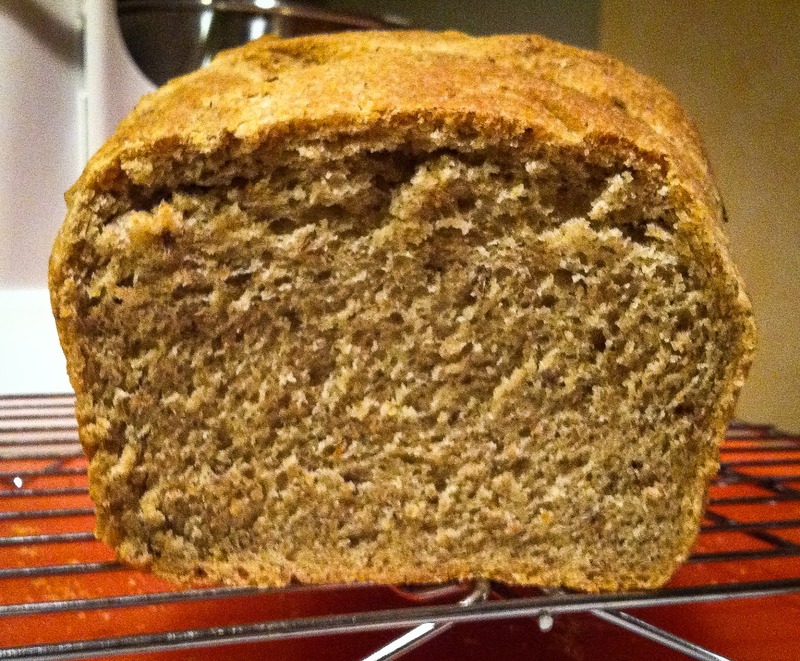 Rye bread has multiple personalities, have you noticed? Seeded or unseeded? Structurally sturdy enough to handle the savory components of a grilled Reuben sandwich, or soft and tender? Boldly seasoned rye complements the strong flavors of spicy pastrami, grainy mustard and dill pickles, while other rye recipes produce bread lighter in flavor, color and texture. Cut it thick for Reubens, or use a single thin slice of dense sourdough rye bread packed with seeds and grains to provide the base for a more refined display of smorrebrod toppings. It is hard to choose just one favorite rye bread. My bread baking efforts typically involve French bread baguettes or sourdough boules. I must have been hungry on Monday morning while watching Pasadena's Tournament of Roses Parade on tv. Old memories of Pasadena dining events popped up, some involving rye bread. Dad loved the 'world famous' pastrami from The Hat on north Lake Street. He rarely ate at the restaurant, preferring instead to order a pound or two of the delicious brined, smoked meat wrapped for takeout, a treasure to build into Dagwood-style sandwiches on rye at home. Dad's creations were piled mile-high and ahhhh-mazing! Mother/daughter shopping adventures on south Lake Street often ended with a stop at the iconic Konditori (long closed), a notable bakery and cafe in the midst of a favorite shopping district. I can't recall a single pastry, but oh! 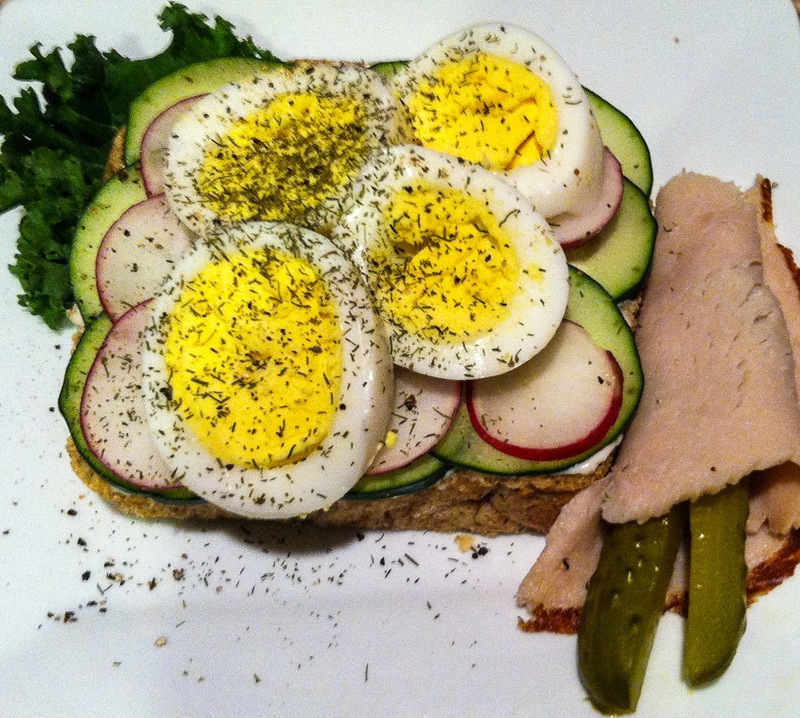 my, those amazing open-faced sandwiches are still dreamworthy. Small, thin slices of rye slathered with butter &/or dill sauce and topped with tiny shrimp, dill fronds, slices or wedges of boiled egg... maybe a few opaque rounds of cucumber... "Oh my, yes! let's order another." Rye bread moved to the top of the Must Bake List (sorry RL, sweets have to wait for another day). A thick King Arthur cookbook provided the basic recipe and included some unusual items: potato flakes and dill pickle juice. I added dried dill weed to the mix, and proceeded with this intriguing recipe. The dough was tacky, as the reciped noted, but I resisted adding more flour to the bowl. My stand mixer didn't care, carrying on without issue, but hand-kneading would have been a sticky, messy chore. It took 2 hours for the dough to nearly double in size for the first rise, longer than a typical rising time for non-rye yeast loaves in my 66 degree kitchen. The second rise, covered in a greased glass loaf pan, ran a full 90 minutes. After 40 minutes of baking in a preheated 350 degree oven the bread did not require the suggest tent of aluminum foil. In fact more browning would have been welcome. Hmmmmm, it's time to recheck the oven's temperature. 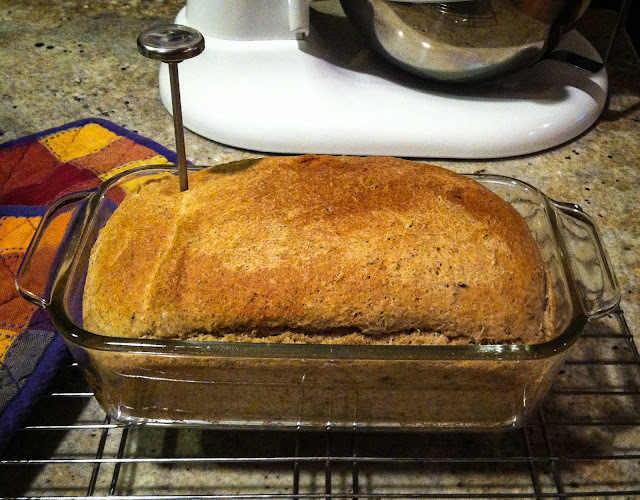 The aroma alone of this loaf stirred my appetite, making the wait for the first taste a difficult exercise in patience. It was worth the wait! 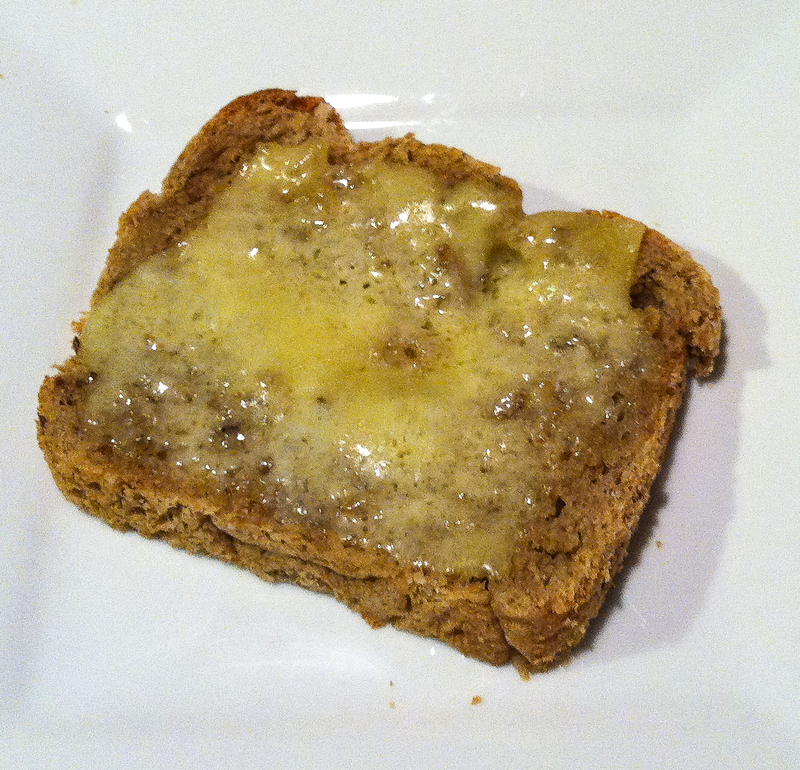 One freshly-cut warm slice, slathered with salted butter, was so tasty that I promptly had another, this time toasted and topped with a slice of white cheddar. Mmmm, the rye flavor, balanced with caraway and dill and just a hint of sweetness, is a very good thing. We might have to arm wrestle to see who gets the last slice. If you use instant yeast, mix together all of the dry ingredients in a large bowl. Otherwise, proof the yeast in water and wait for some action before proceeding. Add the oil, pickle juice and water; mix until a shaggy mass forms. Let the dough rest for 30 minutes to allow the flours to absorb the liquid and give the yeast a head start. Knead the dough for 10 minutes, until firm and smooth though somewhat sticky. (Kneading in a stand mixer is highly recommended!) Place into a greased bowl, turning to coat. Cover the bowl loosely and let the dough rise until doubled, roughly 1-2 hours depending on your kitchen temperature. Move the dough onto a lightly floured surface and shape into an 8-inch long roll. Place in a lightly greased 8-1/2 x 4-1/2 inch loaf pan. Cover lightly with greased plastic wrap and let rise until barely crowned over the edge of the pan, approximately 1 to 1-1/2 hours. Preheat the oven to 350 F. Bake the bread for 35 minutes, until deep golden brown and the internal temp registers 190 F. on an instant-read thermometer. If the bread spears to be browning too quickly, tent it loosely with aluminum foil, shiny side up, for the final 10 minutes of baking. (NOT an issue in my oven.) Remove the bread from the oven, take it out of the pan, and cool it on a wire rack before slicing. Note: delicious as is or toasted, but especially recommended for a Reuben Sandwich, Patty Melt or Open-Faced Smorrebrod. Coq au Vin - it sounds a bit fancy schmancy, but everything sounds fancy in French. It is really just chicken braised low and slow in wine. A winey chicken stew. 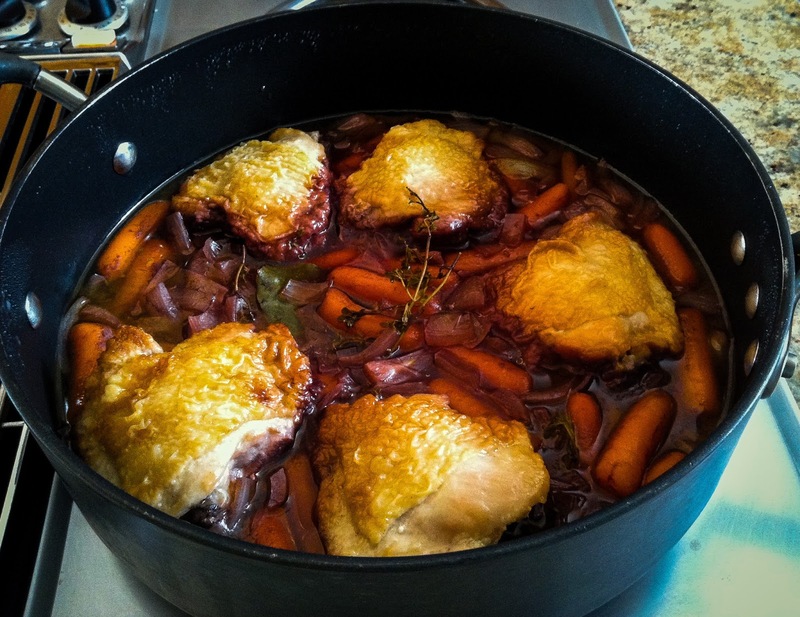 Classic old-school Coq au Vin recipes might include all parts of the chicken, a rooster actually, including the feet and the blood for thickening. It might call for marinating the fowl overnight in red wine, perhaps add a touch of cognac or brandy along the way. Feet and blood?! no thanks. Welcome to 2017 and a modified, simplified version of Coq au Vin... much simpler. 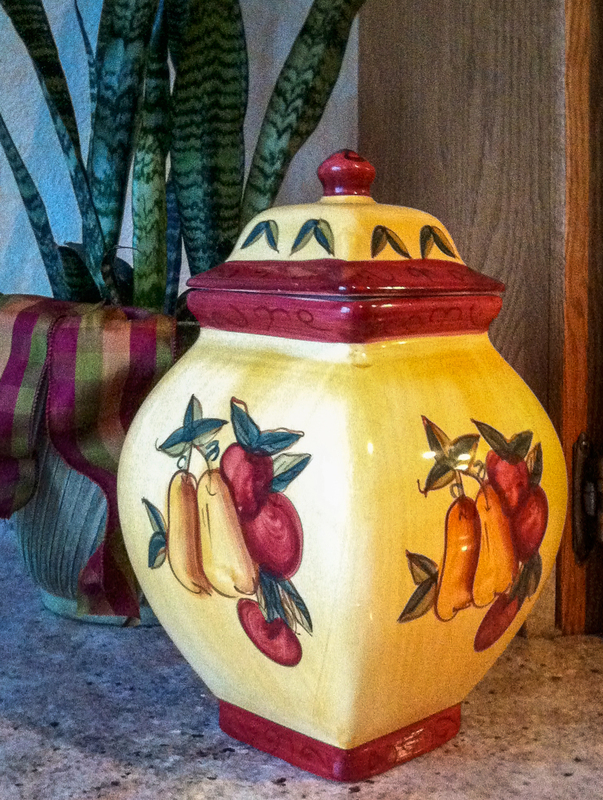 Winter weather tends to focus my food cravings on warming comfort food. A light dusting of snow highlighted the yard this morning and the forecast calls for a near-term cooling trend. Brrrr, it's getting downright chilly in Western Washington. Bring on the comfort food! 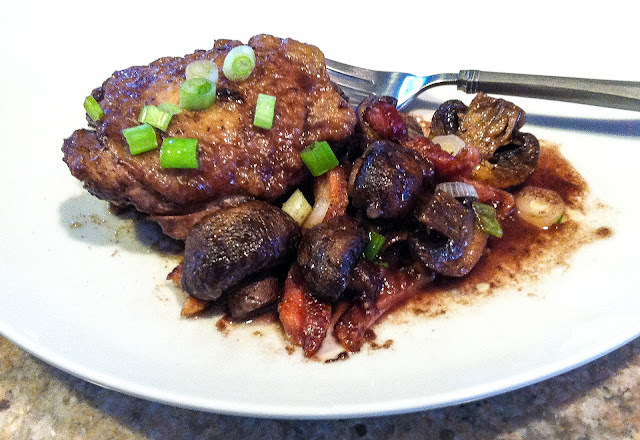 Coq au Vin was today's choice, easy to prepare after a leisurely breakfast and ready to enjoy before the 1:25 kickoff in today's football game. Reheated later tonight or tomorrow, the flavors will further mellow and this dish will taste even better. Why specify chicken thighs? It is so easy to overcook chicken breasts, resulting in a dry, leathery, barely edible toughness. Chicken thighs are a better choice for braising since they are more flavorful, more tender, and stay moist longer than chicken breasts. 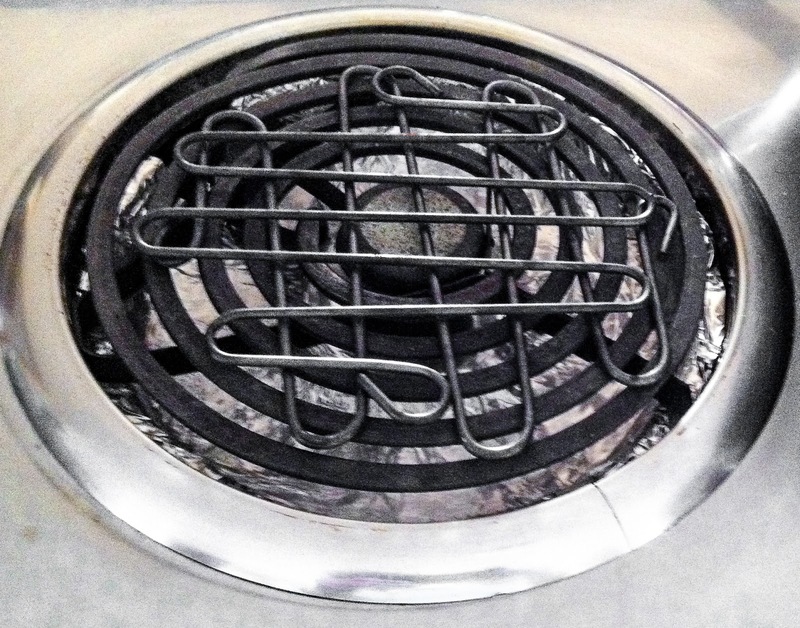 Nonetheless it is important to use a low heat setting to ensure a barely simmering liquid. 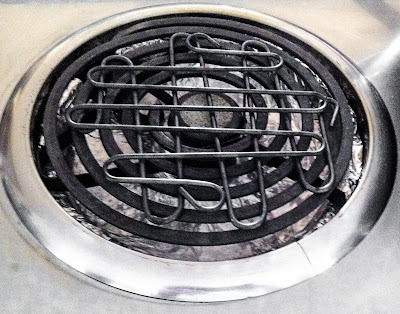 The lowest setting on my electric cooktop adds too much heat, requiring two metal 'flame-tamers' (heat diffusers) to raise the pot above the element coils. Coq au Vin offers moist and succulent chicken thighs, the savory umami of bacon, the texture of flavorful meaty mushrooms, and a savory spicy wine sauce. Mmmmmmm, what's not to like? Heat the olive oil in a deep cast iron skillet or Dutch oven over medium heat. Season the chicken with salt and pepper; dust each thigh completely with flour and shake off excess. Brown the chicken on each side until golden brown, about 10 minutes; remove from the pan and set aside. Deglaze the pot with 1 cup of the wine, scraping up any brown bits from the bottom. Add the carrots, onion, garlic, thyme, bay leaf; stir in the tomato paste, chicken stock and the remaining wine. Return the browned chicken to the liquid in the pot; cover and gently simmer over low heat for 1 hour, turning once or twice. While the chicken simmers, use a second large skillet and cook the bacon until golden and crisp. Remove with a slotted spoon and set aside, reserving the fat. Add the mushroom halves to the fat in the pan and cook until browned; season well with salt and pepper. Add a bit more olive oil (or butter, if you prefer) to the pan if needed. Lift the chicken out of the liquid and set aside. Strain the solids out of the braising liquid and discard those spent vegetables. Simmer the sauce until reduced and thickened to a sauce-like consistency. * Return the chicken to the pan to reheat. Taste and adjust sauce seasonings. 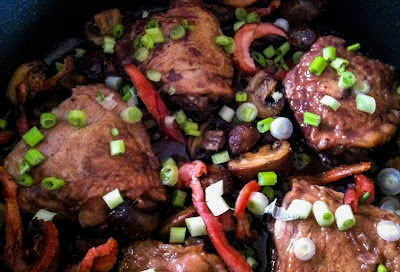 Add the crispy bacon strips, cooked mushrooms and chopped green onions back into the pot with the chicken. Arrange the chicken on a platter and spoon the sauce over the top, or serve in shallow bowls for individual servings. Sprinkle sparingly with a finishing salt (optional) Serve as a stew with crusty French bread, or over egg noodles or potatoes. *If the sauce is too thin after reducing for 15 to 20 minutes, rub equal quantities of flour and butter together with your fingers and add to the pot, one tablespoon at a time, then continue cooking. *If there isn't enough liquid before reducing, add more chicken stock to the pan and carry on.